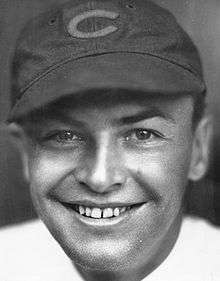 Stanley Camfield Hack (December 6, 1909 – December 15, 1979), nicknamed "Smiling Stan", was an American third baseman and manager in Major League Baseball who played his entire career for the Chicago Cubs and was the National League's top third baseman in the late 1930s and early 1940s. Usually a leadoff hitter, he batted .301 lifetime, scored 100 runs seven times and led the NL in hits and stolen bases twice each. His 1092 walks ranked fourth in NL history when he retired, and remain a franchise record; he also hit .348 over four World Series. His .394 career on-base percentage was the highest by a 20th-century third baseman until Wade Boggs exceeded it in the late 1980s, and was the top NL mark until 2001. Hack led the NL in putouts five times, in double plays three times and in assists and fielding percentage twice each. At the end of his career he ranked second in major league history to Pie Traynor in games (1836) at third base, second in NL history to Traynor in putouts (1944), assists (3494) and total chances (5684), and third in NL history in double plays (255). Hack, who batted left-handed and threw right-handed, was born in Sacramento, California and played baseball at Sacramento High School. After high school he worked at a bank and played semi-pro baseball on weekends. He tried out for the Sacramento Solons in 1931, and was signed by Cubs president William Veeck, Sr. for $40,000 after hitting .352 in his first minor league season that year. He broke in with the Cubs in 1932, and backed up Woody English in his first two years – also hitting .299 in the International League in 1933 – before becoming the full-time third baseman in 1934. In the 1932 World Series against the New York Yankees, his sole appearance was as a pinch runner for Gabby Hartnett in the eighth inning of the final 13-6 Game 4 loss. In his first full year in 1934, he batted a respectable .289 and tied for fifth in the league with 11 steals. In 1935 he began to assume Traynor's mantle as the league's top third baseman, batting .311 and finishing third in the NL in on-base percentage and tied for fourth in steals. He quickly became one of the sport's most popular players, and 21-year-old team employee Bill Veeck (William's son) staged a 1935 promotion in which fans were given mirrors labeled "Smile with Stan", with Hack's face on the reverse side; but the fans used the mirrors to reflect sunlight into the eyes of opposing batters, and the umpires threatened to forfeit the game if they didn't stop. The NL office quickly banned any similar promotions in the future. Batting an unusually low seventh in the 1935 World Series against the Detroit Tigers, he hit only .227 as the Cubs lost in six games. In Game 3 he singled, stole second base and scored to give Chicago a 2-0 lead in the second inning, and singled and scored again in the ninth as the Cubs tied the game 5-5, though they lost 6–5 in 11 innings. In Game 6 at Navin Field he doubled with two out in the sixth inning, and tripled to lead off the ninth with the score tied 3–3, but the Cubs were unable to drive him in. Manager Charlie Grimm opted to let starting pitcher Larry French bat with one out, and French hit a ground ball to the pitcher, with Augie Galan flying to left to end the inning; the Tigers won the Series in the bottom of the inning when Mickey Cochrane scored on Goose Goslin's single. In 1936 Hack batted .298, and tied for second in the NL with 17 steals – the first of five straight years in which he finished first or second. He also scored 100 runs for the first time, and had a career-high 78 runs batted in. He led the league in putouts (151), assists (247) and double plays (25) in 1937, and was second in runs (106) and steals (16) and third in walks (83) while hitting .297. 1938 marked his best season to date as he hit .320 (sixth in the league), led the NL in steals (16), was second in hits (195) and runs (109), fourth in walks (94) and fifth in on-base percentage (.411). He had 67 RBI as the team featured a remarkably well balanced offense, with seven of the eight regulars having between 56 and 67 RBI. He was among the league's top ten players in doubles, triples (a career-best 11) and total bases, led the NL in putouts (178) and double plays (26), and made his first of five All-Star teams as the Cubs won the pennant by two games; Hack finished seventh in the MVP voting. In the World Series against the Yankees, he was one of the Cubs' scarce heroes, batting .471 although they were swept in four games. In Game 1 he had three singles and drove in the only Chicago run in a 3–1 loss. He singled and scored in the first inning of Game 2, and did so again to tie the score 2–2 in the third inning though they went on to lose 6–3. He doubled and scored in the fifth inning of Game 3 for a 1–0 lead, but they lost 5–2; he had two more hits in the 8–3 Game 4 loss. In 1939 he batted .298 and tied for the NL lead in steals with 17, also finishing second in runs (112) and pacing the league in putouts (177). He had another outstanding campaign in 1940, topping the league in putouts (175), assists (302) and double plays (27), finishing fourth with a .317 batting average, and tying for the NL lead in hits (191). He was one behind the league leader with 21 steals, and was fourth in doubles (38, a personal best), fifth in runs (101), and sixth in on-base percentage (.395) and total bases (265). Although he did not make the All-Star team, he finished eighth in the MVP balloting. On May 17 of that year, he suffered a concussion after being hit in the head by a foul ball while standing on third base as a baserunner. 1941 saw him duplicate the previous year's accomplishments by again finishing fourth in the NL with a .317 batting mark and leading the league in hits; he was second in the league with a .417 on-base percentage and 111 runs, fourth in walks and fifth in doubles. And in 1942 he was third in hits and doubles, fourth in runs and walks, and fifth in on-base percentage, while again batting .300 and leading the NL in fielding average for the first time with a .965 mark. 1943 saw a slight dropoff in his performance, though he was still among the league leaders in walks and on-base percentage, with a .289 batting average, and was again an All-Star; but a strained relationship with manager Jimmie Wilson led Hack to retire at season's end. He was persuaded to return in mid-1944 after Grimm returned to lead the team, and batted .282 in 98 games – his lowest mark in over ten years – with similarly lowered averages in slugging and OBP. But 1945 marked a full comeback as he enjoyed one of his best years, leading the NL again in putouts (195) and fielding average (.975), and setting a record with 54 consecutive errorless games. He hit a career-high .323 (fourth in the league), and finished third in OBP (.420), hits (193) and walks (99) and fifth in runs (110). The Cubs won the pennant by three games, and Hack finished eleventh in the MVP vote, won by teammate Phil Cavarretta. In the World Series against the Tigers, he hit .367, though memories of the last game of the 1935 Series lingered. In Game 1 at Detroit he was observed staring out toward third base, and when asked what he was looking at he replied, "I was just looking to see if I was still standing there." He reached base four times in a 4-1 loss in Game 2, and had two hits in the 3-0 Game 3 win. Game 6 at Wrigley Field was a thrilling affair; after a walk and a single in his first two turns at the plate, he singled with the bases loaded in the fifth inning to give the Cubs a 2-1 lead, and went on to score himself. After another walk and single, he came to bat in the 12th inning with the score tied 7-7, two out and pinch runner Bill Schuster on first base; Hack doubled to left field off Tiger pitcher Dizzy Trout, with the ball taking a sharp bounce over outfielder Hank Greenberg's shoulder, giving the Cubs an 8-7 win and tying the Series. But Chicago lost 9-3 in Game 7. They would not return to the Fall Classic until 2016. In 1946 he hit .285 in only 92 games, though he was still fifth in the league with 83 walks. He ended his career in 1947 with a .271 average in 76 games. In a 16-season career, Hack had 57 home runs and 642 RBI; his totals of 1938 games, 7278 at bats and 2193 hits ranked second in Cubs history to 19th-century first baseman Cap Anson, and his totals in hits, doubles (363) and total bases (2889) placed him behind only Traynor among NL third basemen. His 1239 runs were the third most by a third baseman, behind only Arlie Latham (1478) and Lave Cross (1333); his 165 stolen bases were the fourth most by any National Leaguer between 1920 and 1950, trailing only Frankie Frisch, Max Carey and Kiki Cuyler. He was only 27 games behind Traynor's league record for games at third base, and was behind only Traynor and Heinie Groh in career double plays in the NL. His total of 1092 walks – then the most by any third baseman – placed him behind only Mel Ott (1708), Jimmy Sheckard (1134) and Billy Hamilton (1096) in NL history. In 2001, Chipper Jones moved ahead of his career on-base percentage among NL third basemen. Hack became a minor league manager, leading Des Moines in 1948–49, Springfield in 1950 and the Los Angeles Angels from 1951 to 1953, and then took over as Cubs manager in spring training of 1954, replacing Cavarretta. They had losing campaigns during each of his three seasons running the team. He became a batting coach for the St. Louis Cardinals in 1957–58, managing them for the last ten games in 1958, and then returned to managing in the minor leagues in Denver (1959), Salt Lake City (1965) and Dallas-Fort Worth (1966). He later became a restaurant manager, with his second wife Gwen, and died at age 70 in Dixon, Illinois. His first wife Dorothy Weisel Hack was a prominent amateur tennis player. He is buried in Grand Detour Cemetery in Grand Detour, Illinois. Stan had two sons with Gwen: Stanford Hack and David Hack. David had two sons with his first wife, Diane: Michael and Robert Hack, then a son and daughter with his second wife, Deb: Steven and Rebecca. Wikimedia Commons has media related to Stan Hack.